Before the numbers were even in, the science denialist blog Watts Up With That began downplaying the size, strength, wind speeds, overall effects — and even death toll of Super Typhoon Haiyan — a ferocious storm that may have claimed as many as 10,000 lives. 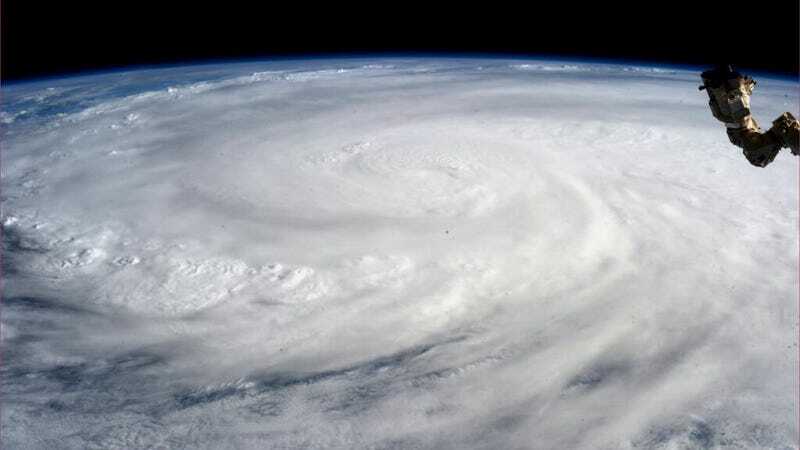 Above: Super Typhoon Haiyan as seen from space. Credit: NASA/Karen Nyberg. The WUWT post, authored by guest blogger Paul Homewood and titled "Super Typhoon Haiyan/Yolanda – another overhyped storm that didn't match early reports," has been revised and updated several times since originally appearing this past Saturday. Homewood and meteorologist Anthony Watts got particular excited by a unit conversion error at the Daily Mail confusing kilometers per hour with miles per hour — a rather sad target given the Daily Mail's poor track record on just about everything. At the moment, nobody is really saying that Haiyan's strength, size, power, or even existence is specifically the direct result of global warming, although it is of course impossible to remove the effects of global warming from ANY weather event because global warming is part of climate change and guess what … weather arises from the climate. The climate has changed, so ALL of our weather is affected by climate change. This offensive post is preemptive denial, but it is denial that throws the lives and suffering of millions of people … of which thousands have lost relatives … under the bus. So that Anthony Watts and his guest poster Paul Homewood can … can do what? Feel smart? Take a shot at the reality of climate change? Pretend severe weather does not matter? What? Maybe they don't like people who live in the Philippines. Haiyan will be measured and remeasured over coming days, but it really is looking like it will be one for the record books. But Watts and Homewood don't care about a big storm this year, or the fact that there have been several big storms in the Pacific, because there were a lot of Pacific typhoons in 1964, before fossil fuels were discovered by humans and thus unlinked to climate change. … ;( … Haiyan will be measured in terms of the death toll and destruction to property and forests, and it will be one of the worst typhoons ever, probably. But Watts and Homewood don't want storms to be important for the simple reason that the best models strongly suggest that there will be more storms … especially in the Pacific, where Haiyan struck, over coming decades because of the changes to climate that humans are carrying out and that Anthony Watts and Paul Homewood deny to be real. Anthony Watts has since shot back with his post, "An ethical challenge for Greg Laden – put your money where your mouth is." Referring to Laden's post as "angry posturing" coming from a "self-imagined moral high ground," Watts is challenging Laden to raise money for the victims of the disaster. "I waited over 24 hours to see if Mr. Laden had a conscience, and if he would offer his blog to help the people of Philippines or was simply interested in his holier than thou tirade against WUWT," he wrote. In his defense, Watts is claiming that the post was merely an effort to show how poorly the media was reporting on the storm. As for downplaying the death toll, he's sticking with the last report of the Red Cross number of 1,200, saying "I trust them because their mission has no agenda other than aid." Both parties involved in the online fracas are right to point out that all numbers, from the wind speed through to the death toll, still need to be confirmed. But as of this posting, it appears that Haiyan produced winds gusting up to 194 mph (378 km/hr), making it one of the most powerful storms ever recorded. And by some estimates, at least 10,000 people may have died in Tacloban alone. Image: Credit: NASA/SSAI, Hal Pierce.